In today’s society we have the ability to share every aspect of our day whether it’s through twitter and sharing every thought or through our cell phone cameras to document everything. It’s the same thing with photographers, and I was as guilty of it as anybody. In the past year, I have seen dramatic increases in my photography ability and I attribute some of it to committing myself to taking LESS pictures. Tonight I was out looking for a shot of Bozeman at sunset. The sunset was amazing, but I didn’t take one shot and I’ll tell you why. I used to drive/hike/adventure around with my camera fixed to my eye and taking pictures of everything I see. In the process taking hundreds of pictures, and upon getting home most of them I would just glance right over looking for that one or two shots that I know were the best. At that point, I came to the conclusion that those other shots were of no use and I was wasting time. So I began looking at every moment as a “would this photo be a keeper?”. I analyze the light, the composition, and in my head determine how the shot would turn out. And because of this I found that I was getting better photos because I was patient and wasn’t missing other events around me. Tonight’s sunset was beautiful, but none of the vantage points I could have been would have made for a photo that I would like to use. My best advice for people taking photos of sunsets is to look around. Too many people just aim their cameras at the sun setting and miss the amazing light all around them. My favorite sunset are facing away from the setting sun. Recently on my trip to Africa I practiced this rule and captured some of my favorite photos of all time. It was amusing because I would be in a vehicle with non-photographers with very nice photography equipment. We would return to the lodge at night and were amazed at how much better my photos were turning out with virtually the same equipment. Part of it has to do with my extensive knowledge and experience and the other part comes down to patience. 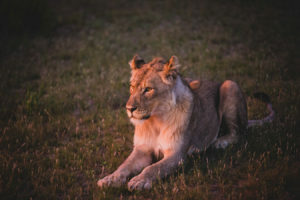 One evening we were surrounded by lions and everyone in the vehicle was rapid firing their cameras every direction practicing the “shoot and pray” method. But for me I waited and only took a handful of shots. I enjoyed watching the lions play and took in the scene with my eye instead of focusing on only getting images. In conclusion, sometimes less is more. Since committing to take less photos I have learned to enjoy the moment more and look for the little details that can make or break my photos. I’m nowhere near where I feel my potential as a photographer is, and I can’t wait to share this journey with all of you! I enjoyed this read. A love photography and have been guilty of not enjoying the moment because I’ve been too damn busy trying to get a cool photo or wanting to post a cool moment to social media. Also, by taking less photos of better quality you save yourself a lot of hours in the editing room! Excited to read more from you, Andy!